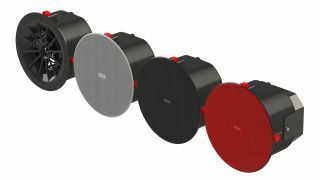 With the goal of “bringing extraordinary audio experiences to conference rooms,” Biamp used its presence at ISE 2019 (Stand 3-B120) to introduce the desono line of conferencing speakers with optional AMP-450BP backpack amplifier, which offers Biamp audio quality and easy installation for integrators. The desono C-IC6 conferencing speakers incorporate helpful design features including termination-free connections using standard category cables, an easy-to-mount removable magnetic grille, and acoustic performance tailored for superior speech reproduction, making them ideally suited for conference rooms. Accompanying the desono speakers is the optional PoE+ AMP-450BP amplifier that mounts cleanly onto the back of the speaker, eliminating the need for multiple cable runs back to the rack. Each backpack amp powers up to seven additional desono speakers via category cable, creating a 100 percent termination-free installation, enabling a structured cabling crew to complete the entire above-ceiling audio rough-in for a conference room. Additional installation-simplifying features include dual RJ-45 ports for daisy chaining, and standard 4-pin euroblock connectors, providing additional flexibility for projects that use traditional speaker wiring. The AMP-450BP amplifier is designed with multiple mounting options and can be backpacked onto the speaker, mounted to a wall, or suspended from a Biamp tile bridge. The desono family of conferencing speakers and AMP-450BP amplifier are expected to be available in the second quarter of 2019.